Last Friday the Australian Energy Market Operator (AEMO) released its annual Electricity Statement of Opportunities. This was widely (and inaccurately) reported as predicting widespread blackouts. The Sydney Morning Herald reported “a one in three chance of power failure in Victoria unless immediate action is taken”, a prospect described by Victoria’s opposition energy spokesman David Southwick as “completely unacceptable”. In Adelaide, The Advertiser reported that South Australia faces a one-in-ten chance of forced blackouts this summer. Unfortunately, the commentary around AEMO’s annual statement has become increasingly misleading and irresponsible over time. The media reporting and public comments are tacitly or even explicitly advocating for the generation system to be “gold-plated”, which would come at great expense to consumers. Reliability, as defined in the National Electricity Market, is a measure of the ability of the grid and its associated electricity generation infrastructure to meet consumers’ demand. But the vast majority of power outages experienced by customers do not fall under this definition. Some 97% of blackouts are caused by faults or other incidents on the network, rather than a failure to install enough capacity to meet reliability standards. The blackouts that hit customers in New South Wales and Victoria over the weekend were perhaps inevitably described in parts of the media as a “dramatic reminder” to new Prime Minister Scott Morrison of the importance of addressing energy policy. But of course it is hard to legislate against lightning, which in this case triggered two interstate interconnector cables to trip and cause blackouts. Sources of supply interruptions in the NEM: 2007-08 to 2015-16. Let’s have a look at what the reliability requirements actually are, and what AEMO’s Electricity Statement of Opportunities does and doesn’t say about the situation. Leaving aside the majority of blackouts due to faults or incidents, there are also some relatively rare times when there is simply not enough generation or transmission capacity to meet demand. This leads to “involuntary load shedding”, which is where certain customers’ energy demands go unmet – which they would experience as a blackout. This unmet energy demand is referred to as “unserved energy”. In the National Electricity Market, we have a reliability standard which specifies that expected unserved energy should not exceed 0.002% of total energy consumption in any region in any financial year. In other words, the system is expected to deliver at least 99.998% of the energy demanded by consumers. Historically, our grid has generally passed this standard with flying colours. Unserved energy in the NEM: 2007-08 to 2016-17. Anyone who’s ever suffered the frustration of a power cut might ask why the reliability standard isn’t 100.000%. But building an infallible system – to the extent that it is even possible – would be hugely expensive. To do it, we would need enough capacity to supply every conceivable power demand scenario, no matter how outlandish. What does AEMO’s statement say? The annual Electricity Statement of Opportunities is intended to inform the market about when and where new generation is expected to be needed. This allows project developers to sharpen their pencils, develop and commit to new power projects. As the title of the report suggestions, it reveals opportunities for new investment. As part of this exercise, AEMO forecasts the expected unserved energy in each region over the coming decade. Importantly, the base forecast only assumes “existing and committed projects”. Committed projects are essentially new generation assets that are fully financed. It also doesn’t include the temporary diesel generators installed in SA last summer, or the efforts to procure emergency reserves through the “Reliability and Emergency Reserve Trader”. These measures further reduce the likelihood of involuntary load shedding. Simply put, the statement forecasts the expected unserved energy over the next decade, if there is no further investment and the market operator fails to procure emergency reserves. Forecast USE outcomes – neutral demand, only existing and committed projects. Granted, this year’s report does shows an increased risk of unserved energy, compared with last year. In Victoria, this is primarily due to an increase in the forced outage rate assumptions for ageing brown coal plants. But the report also notes that AEMO expects the reliability standard to be maintained in NSW, Victoria and SA every year for the next decade, in the neutral scenario of its “Integrated System Plan” (ISP). Forecast USE outcomes – ISP Neutral development plans. The level of unserved energy in Victoria is forecast to fall to within the reliability standard. AEMO says this is due to the substantial volume of additional new intermittent generation developed in Victoria to meet the state’s renewable energy target, and additional interconnection called for within the ISP scenarios. 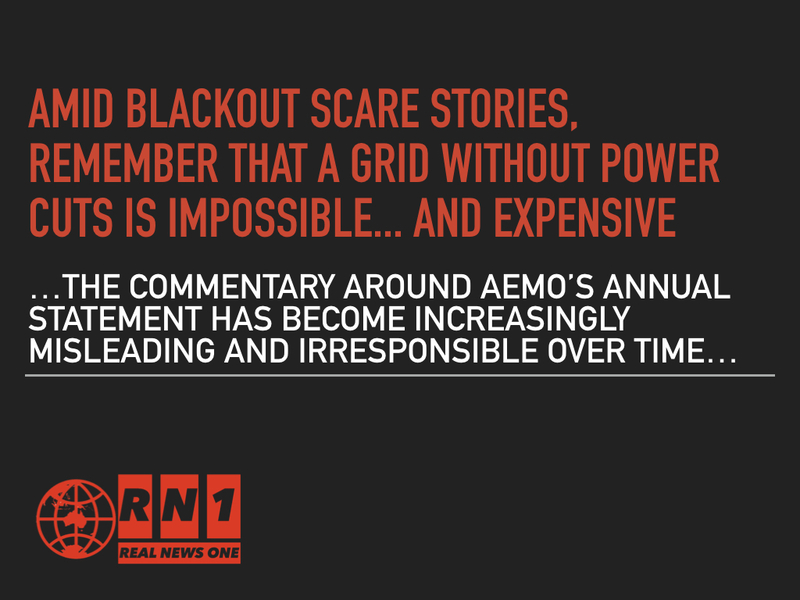 The media and politicians have seized on the “one-in-three chance of a blackout”. And it’s true: AEMO did indeed report a one-in-three chance of unserved energy in Victoria this summer. But this figure is misleading when taken out of context. While there is a fair chance that some energy demand will go unserved, AEMO’s report also predicts that it will be below 0.002%, thus meeting the reliability standard. There is actually always a chance of some unserved energy. As discussed above, the aim isn’t to have no power cuts at all, but to keep them to an economically acceptable level. The fevered commentary misses this crucial nuance. But if it sells a few more newspapers, what’s the harm, right? Well, here’s the harm. Beating up the likelihood and significance of blackouts has real cost implications, as we have seen over the past decade through the gold-plating of “poles and wires”. Last month the Australian Competition and Consumer Commission released a report that specifically said “large cost increases in NSW and Queensland were due to the imposition of high network reliability standards on distributors in those states”. These high reliability standards were imposed after a series of minor blackouts in 2004-05. At a time when electricity prices are front-page news, unfounded hysteria about the risk of blackouts risks subjecting customers to yet more gold-plating. The community deserves to know the actual costs of improving our already highly reliable electricity system, rather than being fed fearful stories about the lights going out.